Parents of many children ages 3 and up who should still be in child-safety seats will be warned not to use a federally required child-seat attachment system when a new rule takes effect in early 2014. The rule requires child-seat makers to tell parents not to use the lower anchors required in cars since 2001 if children and their car seats have a combined weight of 65 pounds, because the strength of the anchors cannot be guaranteed. Child seats typically weigh 15 to 33 pounds. So the new rule means some children as light as 32 pounds might not be able to use a system designed to make child seats easier to install and, therefore, safer. 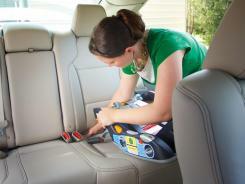 This child-seat system is known as LATCH (Lower Anchors and Tethers for Children). Joseph Colella, one of five child-safety advocates who petitioned the National Highway Traffic Safety Administration (NHTSA) to change the rule, says the anchor requirements are based on old child seats and outdated recommendations on how long kids should be in child seats. The Alliance of Automobile Manufacturers sought the change in the rule because limits weren’t factoring in how much seats weigh. Colella says carmakers aren’t able to guarantee the safety of heavier kids given the strength of LATCH anchors. The alliance was not available for comment. The advocates say the minimum strength requirements should be increased. LATCH use and awareness are already low. A study last summer by the advocacy group Safe Kids Worldwide found child-seat checkpoint technicians were using the lower anchors to attach seats only about 30% of the time. And Safe Kids found just 30% of parents use the top tether straps, which prevent head injuries in crashes. “Disconnecting tethers when their use is needed … could lead to a tragedy,” says Stephanie Tombrello of advocacy group SafetyBeltSafe, one of the petitioners. Colella’s 3-year-old niece died in a 1994 crash in a child seat that didn’t fit the car. That prompted him to push to make child seats more compatible with cars, an effort that resulted in the federal panel that recommended LATCH. LATCH is considered easier than a safety belt to tightly secure a child seat. “While LATCH makes it easier to properly install car seats in vehicles, it’s important for parents and caregivers to know that securing a child seat with a seat belt is equally as safe — and that they have the flexibility to use either system,” says Transportation Department spokeswoman Lynda Tran. The American Academy of Pediatrics recommends children use car seats with harnesses through age 8. AAP’s recommendation and supporting research led child-seat makers to design more seats for children 65 pounds and over.